For some months now I have called myself a ‘Corbynista’. I am proud to back a man who demonstrates more integrity, courage, decency amd honour than almost every other Member of Parliament put together. 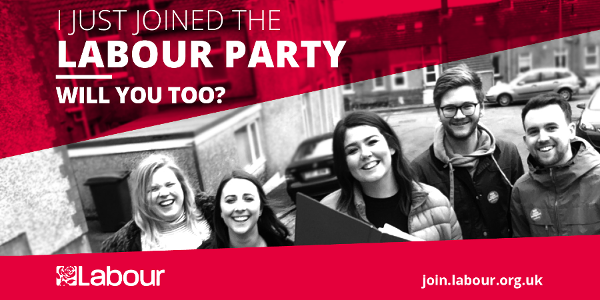 Today, in the face of the ever-escalating smear campaign, the completely ludicrous and false allegations of antisemitism, the vile abuse of the BBC and the despicable right wing press, I have signed up to become a member of the Labour Party. I remain a Tory because I believe in fundamental principles of individual liberty, individual responsibility, small goverment and free markets. I am not and never will be a socialist. I do not believe it is is right that the state should own the means of production and supply because this inevitably leads to complacency and inefficiency. Competition is a healthy motivation and inline with human nature. Socialism, in my view, is a delusion. It has never worked, anywhere in the world and it never will. However, I do consider that there are certain industries that are best owned by the state, those that are natural monopolies such as energy, water, the railways, the road system, the basic health service and basic communications and internet infrastructure. So I would support re-nationalisation of these industries. I am unlikely to remain a member of the Labour Party forever. My reason for joining in the short term is to support Corbyn as the only decent leader in our country and because the overriding priority now is to bring down this corrupt, self-serving Conservative government. The Conservative Party is unfit for government. It has trashed the huge opportunity that Brexit offered by appalling, irresponsible infighting. It would be best if it simply disintegrated. It has brought shame on our nation and many, perhaps most, of its MPs simply disgust me with their venal and selfish behaviour. Mind you, I feel the same way about the treacherous, Blairite Labour MPs who have repeatedly stabbed Corbyn in the back. Chuka Ummuna, Chris Bryant, Margaret Hodge, Luciana Berger, Yvette Cooper, Harriet Harman and others – I put them in the same category as most Tory MPs – worthless. It’s true, in the past five years I have belonged to the Liberal Democrat, Conservative and now Labour parties. I very much hope for the establishment of a new, centre-right, liberal and progressive party and I would join it in a flash. Some may find this difficult to understand but I am not a tribalist. I think tribalism is probably the most destructive force in politics. What drives me is principles first and policies second. Once we have got rid of the Conservatives, I shall become concerned with policies again and those will be in line with my fundamental Tory principles. I remain a true Tory, not the corrupt, self-serving, authoritarian example set by the diabolical Mrs May. For now I am a member of the Labour Party and I will do all I can to see Jeremy Corbyn become our next prime minister.